The back-flow stop valve automatically closes when water or sewage flows back through the drain system during flood conditions. The stop valve allows normal sewage flow from the inlet to the outlet side of the valve with absolutely no flow restriction. 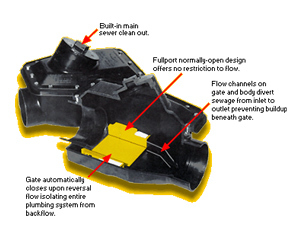 Integral stop points in the wing area plus built-in flow channels combine to direct the sewage through the valve protecting the gate from soil contamination caused by sewage flow beneath the gate. 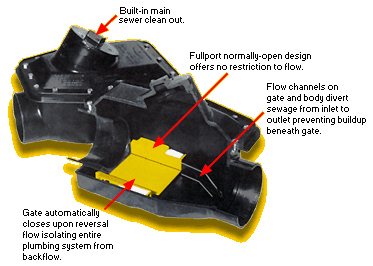 The Mainline Fullport Backwater valve also has a built-in inspection cover to facilitate rodding of the main building drain. Non return valves or backwater valves are used within sewerage and drainage systems to eliminate the risk of flood damage by the backflow of sewage into properties through low level entries such as low level drain gullies, toilets and washing machine outlets. The Environment Agency in their publication on damage limitation for properties at risk from flooding and the Government guidance note “Preparing for Floods” both recommend the installation of non-return valves (anti-flooding devices) on all drains and sewers. Designed for connection to slid walled PVCu pipe these valves can be connected to other pipe materials using our wide range of coupling's (See Coupling's).